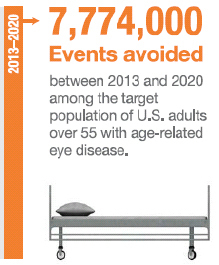 Washington, D.C., May 1, 2014—Age-related eye disease (ARED), such as age-related macular degeneration (AMD) and cataracts, is currently threatening the vision of our elderly population and with limited treatments available for reversing the damage caused by ARED, taking preventive measures is key. A new economic report, “Smart Prevention – Health Care Cost Savings Resulting from the Targeted Use of Dietary Supplements,” points to lutein and zeaxanthin dietary supplements as one of these potentially preventive measures. 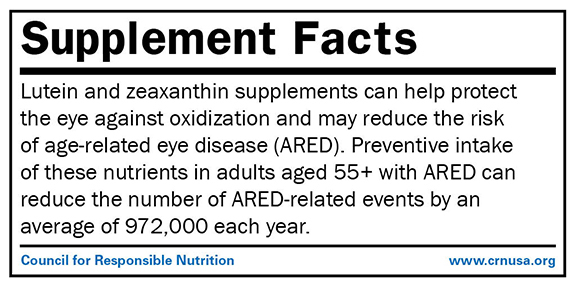 In addition to reducing the risk of an ARED-related medical event (as found most recently in the AREDS2 study which demonstrated that for those not getting enough lutein and zeaxanthin in their diet, supplementing with those nutrients led to a decrease in advanced AMD progression, a reduction in risk for severe cataracts, and reduction for progression to cataract surgery), the supplement regimen can also save individuals and society money. “Smart prevention is protecting your health and also protecting your wallet. Age-related eye disease poses risks that are debilitating and expensive, so supplementing with lutein and zeaxanthin can help reduce those risks,” said Duffy MacKay, N.D., senior vice president, scientific and regulatory affairs for the Council for Responsible Nutrition. It was the Council for Responsible Nutrition’s Foundation that provided a grant to the economic firm Frost & Sullivan to conduct the report. The report is packed with estimates for the number of medical events that could be avoided and estimates on societal healthcare cost savings—including this impressive statistic: an average of $3.87 billion per year in avoidable health care utilization costs is potentially realizable if all U.S. adults over the age of 55 diagnosed with ARED were to use lutein and zeaxanthin dietary supplements at preventive intake levels. To achieve the results, Frost & Sullivan conducted a systematic review of scientific studies that focused on studies that looked at the relationship between lutein and zeaxanthin supplementation and the risk of an ARED-attributed event. The firm then projected the rates of ARED-attributed medical events across U.S. adults over the age of 55 with ARED and applied a cost benefit analysis to determine the cost savings if people in this targeted population took lutein and zeaxanthin supplements at preventive intake levels. The full Frost & Sullivan economic report and accompanying materials, including a lutein and zeaxanthin infographic, are available for free at www.supplementforsmartprevention.org.